Lakedale Resort Lodge. Photo credit Lakedale Resort. I have recently returned from what I have to admit is my happy place and I can’t wait to go back! 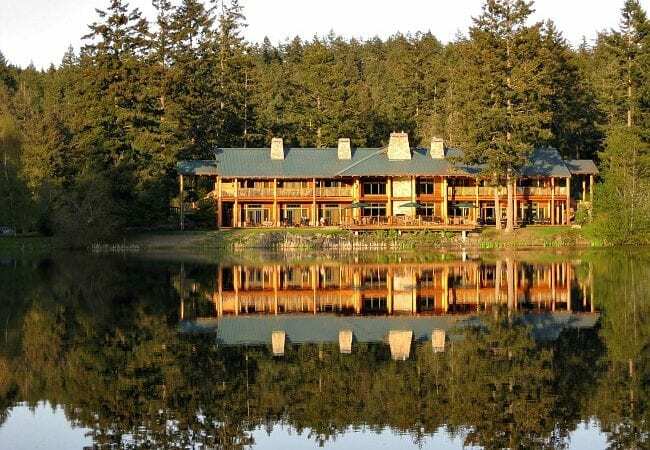 I’m talking about the Lakedale Resort on San Juan Island in Washington State. This is one of those properties that does it all and does it all well. No matter your budget, whether you’re a couple or with the grandparents, or if you want to hike or just relax with a book on its 85 acres, it offers something for everyone. 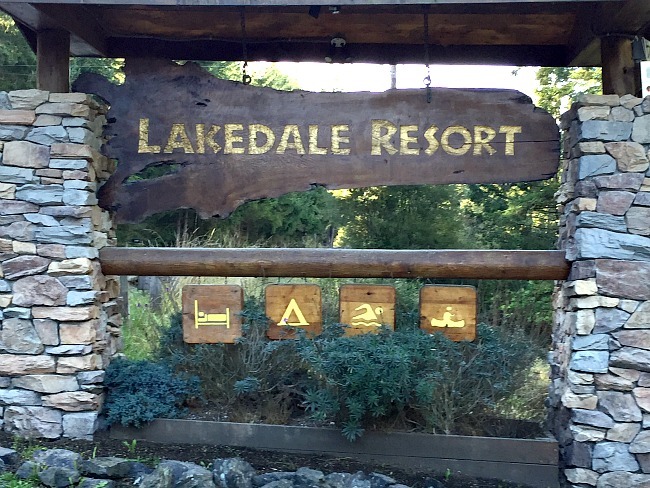 The entrance to Lakedale Resort. Photo credit Dana Zucker, Triathlon Traveling Mom. I have not really spent a lot of time in the state of Washington and decided that needed to change. When I first started to look for a place to stay on San Juan Island, I looked on the CVB visitors’ site and discovered this little gem right in the middle of the island surrounded by three lakes. 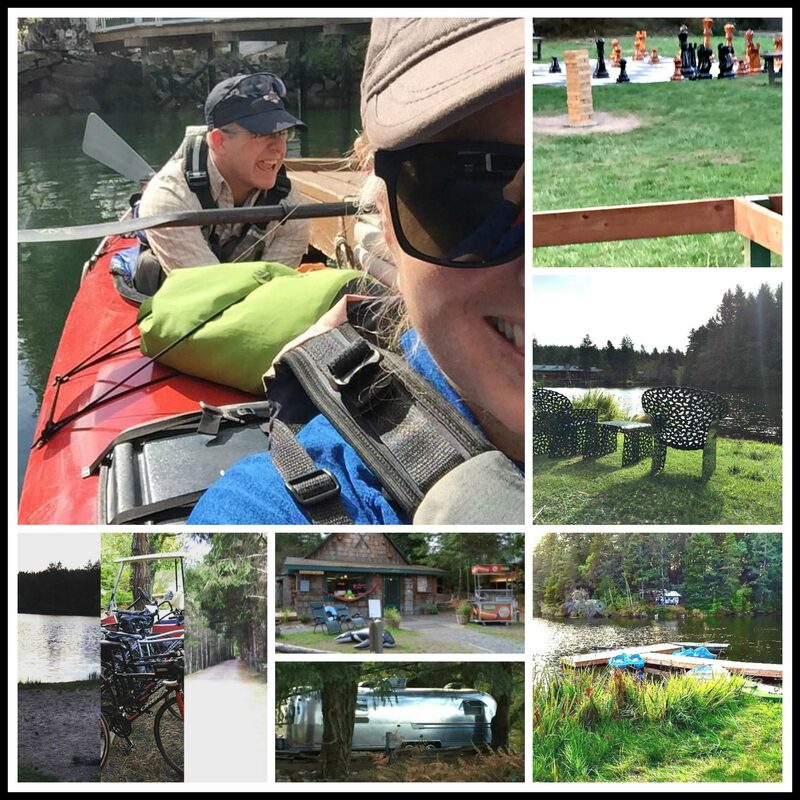 Lakedale Resort has camp sites, beautiful canvas tents, glamping tents, log cabins, ten rooms in the lodge, a lake house, and even an air stream trailer. Seriously, it’s a true silver bullet you can stay in. The Silver Bullet! Photo credit Dana Zucker, Triathlon Traveling Mom. And not only can you choose from all levels of accommodations, you can also choose any level of activity. You can sit by one of the three lakes and do nothing or you can take a swim, fish, hike, visit the arts tent, participate in the many activities on the property, or venture off the property and explore the island. I have to say we actually chose to pretty much do it all! Another great reason we’ll be going back is it works as a destination whether you’re going solo, on a couple’s trip, family getaway, or multigenerational gathering; everyone will find something to their liking. I can bring my college-aged twins, my mom and dad, and a seven year old nephew. There’s a General Store on the property for all you need and want, including s’mores kits. If you want to camp, but either don’t have a tent or don’t want to bring one, you can use the resorts. There is an Activities Tent that includes both free and pay-to-play choices. There is tons of open space to hang out and explore. The island is a natural playground. There are three beach areas with non-motorized boat activities. 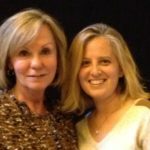 There’s a safe area for older children to have some independence. Many lodging options are pet-friendly. There is no full restaurant on property, but lots of nearby options if you feel like a no-cook night. There is no cell service on this part of the island, although many would find this a positive! There is no cable/TV service. Again, many may find this a positive. Summer is the high season and although the cabins, lake house, and lodge are away from other lodging areas and the activity tent, we were told it can get very busy. If you are looking for a less crowded time, visit after Labor Day and before Memorial Day. 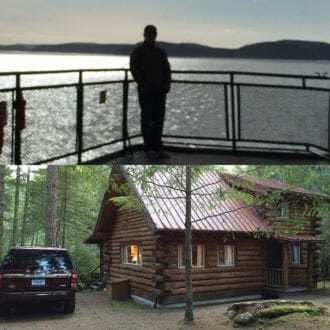 In order to get to San Juan Island, one of about 172 islands known as the San Juan Islands, you have to either take a ferry or hop on a small plane from Seattle, which we flew into from Omaha. This gave us a chance to enjoy a few days in the city before heading to the island. Besides, I love ferry rides, so this was not an imposition to me. We rented a car in Seattle and took it with us on the ferry, which you need to make reservations for. You can rent them on the island, but be warned, they are very scarce. I highly recommend having a car to explore and get around and so you’re not relying on anyone for transportation. Lakedale is in the middle of the Island, so navigating is easy. That said, it’s not mandatory, as there are shuttles and buses – your choice. Enjoying the ferry on our way to Lakedale Resort. Photo credit Dana Zucker, Triathlon Traveling Mom. The staff at the resort is attentive and are there for you. For example, the cabins are not cleaned daily unless you request it and there is no additional fee. But, if you are like us and like our privacy and space, you can request your towels be changed just by putting them on your porch in the bag provided. 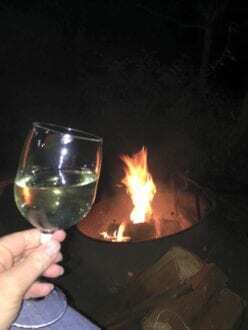 We decided to make a fire one night and realized we needed more wood and sent a note and that night there was wood in our fire pit. Nice. With so much going on, one would think Lakedale would be crowded, but it is not. Areas are spread out and although we are told my management that the summer will be full, there is over 85 acres and the management has been reducing the number of sites from what was originally there. This is being done in an effort to enhance the experience for all and to meet customer demand. The grounds and building are just beautiful and traditionally built in log cabin style. Everything is in beautiful condition and very clean. Honestly, I did not want to leave. We were not in the “camping” mood, so Lakedale put us up in one of the six log cabins. Each cabin has two bedrooms and two bathrooms. Downstairs has one bedroom with a queen bed and also a sitting area, large kitchen table, and the best equipped kitchen we have ever had. Upstairs you’ll find the other bathroom with two double beds. 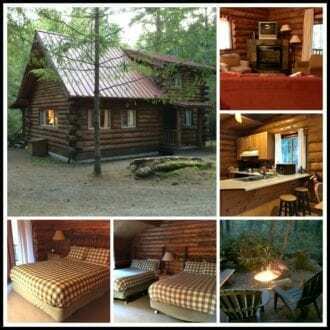 Our cabin at Lakedale Resort. Photo credit Dana Zucker, Triathlon Traveling Mom. In the backyard there is a grill, picnic table, and fire pit. The six cabins also share a hot tub. If you are traveling with a large family or group of friends, Lakedale has a great lake house for your group. And if you are looking for a traditional lodge room, there are ten rooms in the main building that I love, but they only for children 16 and older. If you’re into camping, you can bring your own tent to the beautiful sites and choose from one tent or family sites. The grounds are beautiful making any site desirable. If you do not want to bring your own tent and “rough it”, you can stay in one of Lakedale Canvas Tents. These are beautiful platform tents with everything you need except a bathroom; that you have to share with your fellow tent mates. Another bonus to staying in a platform tent is you have your breakfast in the mess tent. The breakfast is carefully planned by the head cook, Mary Anne, and is staffed so if you need a hand someone is there. If a shared bathhouse is too much of “roughing it” it for you like it is for me, no worries. You have plenty of other options. How about a Glamping Canvas Tent fully furnished with an en-suite bathroom and a chandelier? 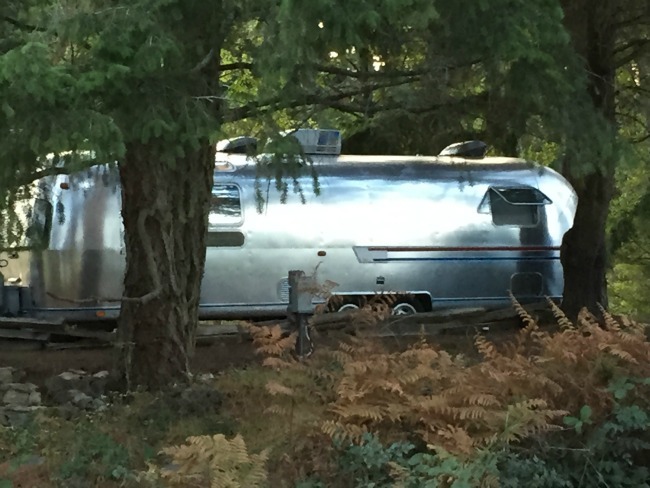 Or an Airstream? I mean who doesn’t have a little bit of air-stream dream in them? You can even bring your own RV, although sites are limited. 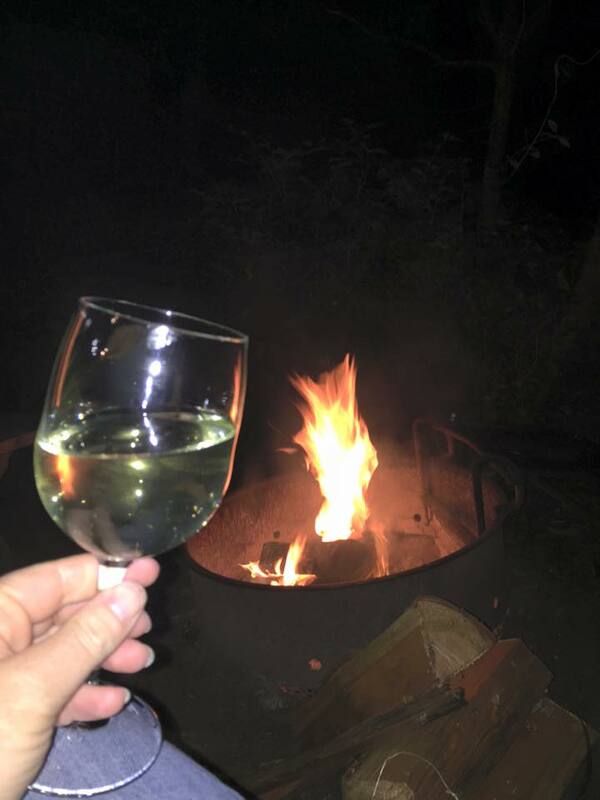 Camping in style at Lakedale Resort. Photo credit Lakedale Resort. The rooms have a TV, but given the location, there is no cable. You can stop by the office to pick up a DVD to watch if you want or bring your own. Honestly, we never turned on the TV, but we did turn on the fireplace in our family room. Canvas tents and the lodge include a well-rounded breakfast. During the off season, there are all types of specials and special packages offered. The cabins and the Lake House all have full kitchens that are well equipped, including tools for the grill which we have never seen in a rental before. We were thrilled. The amenities at Lakedale Resort are endless. I seriously don’t even know where to start. Breakfast is provided for both the Canvas Tents and Lodge guests. In the Lodge, the wonderful Mary Anne will prepare you a full breakfast that will keep you fueled for a busy morning. The food is wonderful and made with whole, real and fresh ingredients. Her eggs are just like we love them; loaded and scrambled and her yogurt is whole milk greek, which she serves with her homemade granola on the side. There are plenty of gluten free options as well. The canvas tent mess hall is staffed by one of Mary Anne’s crew. There are plenty of healthy options and there is even a pancake maker in there. Myriad of activities at Lakedale Resort. Photo credit Dana Zucker, Triathlon Traveling Mom. Or if you happen to be on the island at the right time, a little whale watching might be in order! 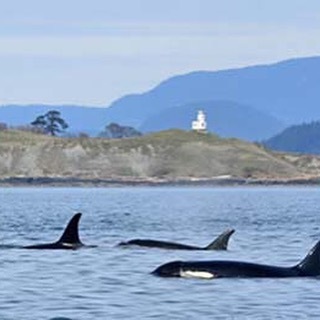 A little whale watching on San Juan Island. Photo credit San Juan Outfitters. Dining is the only difficulty you need to really be aware of when staying at Lakedale Resort. There are no on-site dining options, other than the breakfast as noted above. This is no big deal if you are staying anywhere but the Lodge. All other lodging options have both outdoor options only or both ourdoor and full kitchens. A sample of what we cooked outdoors at Lakedale Resort. Photo credit Dana Zucker, Triathlon Traveling Mom. You can shop the General Store for ready made options or what you need to prepare your own. Mary Anne stocks it with lots of lunch and dinner options, including her famous kabobs and s’mores kits and plenty of sides. In the summer, you can swing by and get a hot dog or other favorites from the cart. 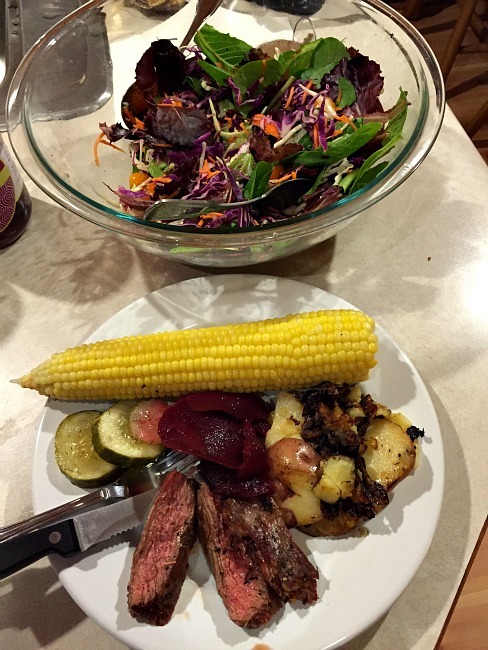 It’s really easy to go to Friday Harbor or Roche Harbor for groceries, lunch, or dinner. They’re close and offer a ton of dining options. We were thrilled with everywhere we ate, including a vegan restaurant. I know many large cities that don’t have a vegan restaurant and here on little San Juan Island there it is and man, was it good. We even had a wine pairing with our meal. To a great vacation at Lakedale Resort. Photo credit Dana Zucker, Triathlon Traveling Mom. All I can say is we will be back! 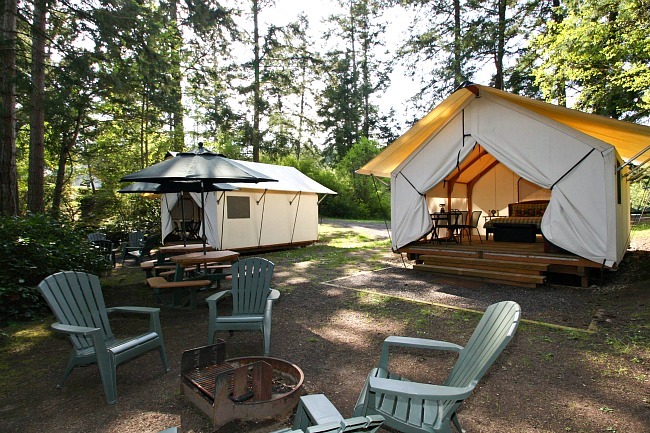 The foodie in me wants to go back for the Glamping Cookout with one of the local or Seattle chefs and my hubby wants to do the triathlon. I think we can make both of us happy.